This is not a bug, it is the result of notch making the damage sound more unisex instead of strictly male. Details: Place a bucket of water on top of a lilypad, and the lilypad disappears. Bug or Glitch? On midnight I had set a few trees on fire, fully engulfed in flames. Then I wander off for a while far away from those burning trees. When I came back, the trees were gone(and left some floating pieces of wood and leaves that was unharmed). It was daytime at this point but as the night came again, there was light on the ground where the trees were before. There is no kind of light sources anywhere nearby but light just stayed on the ground as if the fire was still there burning. I restarted my client to see if it would go away but didnt. Restarted the server too but the light was still there. Later on I eventually made a new world and deleted that one. =/ What was wrong with the lighting? Sometime I click to place block and it doesn't work. I drank a potion and I threw the bottle and it broke. That was the first time I ever drank it. Bug name: Steve has landphobia? Details: When switching from creative to survival using external means or a mod (Such as to many items) while flying, Steve will take damage on landing. EX: You switch to survival while flying in creative. you fly down 4 blocks. You will take half a heart of damage. This also happens with fire resistance potion while bobbing in lava, when you go onto land you take damage equal to your bobbing. Sorry if this is already known, I searched the thread for "Creative" and nothing popped up. I don't understand why you would think that is a bug. Switch rules, rules change. Right? Details: I've studied my sheep for many Minecraft days (I have about 10 or so) and not one has eaten any grass to regrow wool. It seems to be bugged for multiplayer at least, I have no idea about singleplayer. Details: i rarely heard anyone with this bug but i have this bug. 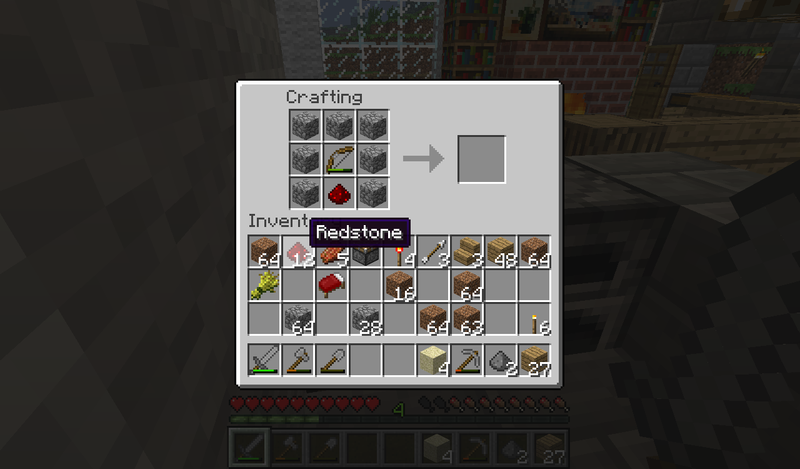 i have the right stuff, the cobblestones, th redstone dust, and the bow but when i position them correctly as it can be, no dispenser comes out of my damn crafting table. PS: hey, im new here. I had a cow farm with a fence and I put a sign on the fence, and from a side view it is floating 6 inches away from the fence. Also, if you stand on a fence, you float 6 inches above it. A third bug is that a WOODEN slab is easier broken with a pickaxe than a axe. The bow can't be damaged. oh, sorry, didnt know that ._. the minecraft wiki didnt said anything about that. Details: Well it looks like sand from a desert i put my house in thats next to a taiga biome. and in that taiga has random sand like if the grass has replaced it self and turned into sand. that sand that spawned in the taiga biome now i guess counts as a desert biome. So then i go to my friends lets play world and under his house are holes like creeper explosions or TNT. What is going on is my minecraft destroying it self? Black Veil Brides, My Chemical Romance, 30 Seconds to Mars, Motionless In White. Possible bug, not sure: Hands and feet of skin are reversed in game, but checked normal in multiple editors. Now I have to reverse it in the editor for it to look right in minecraft. I have heard rumors that the model format has been changed as of 1.0.0. Could this be related? I found a bug were grass grows under water. I was playing multiplayer and I walked across a grassy biome with a small patch of water in it and under the water was grass. How could this be?